Reliable performance is basically guaranteed through years of experience for law enforcement and civilian shooters in life and death situations with the 9x19 Golden Saber projectile. It is among the most reliably mushrooming and reliably feeding projectiles in any loadout configuration by any company. The uniformity of the projectile expansion and the consistent mushrooming/peeling effect are leaps and bounds above many other competitors. Remington can count on a few fingers, the competitors that can even come close to the type of hollow point performance that is inherent in the Golden Saber bullet line. It is a true testament to the foresight and engineering prowess of the team at Remington and their years of expertise in designing and producing 9mm ammunition. 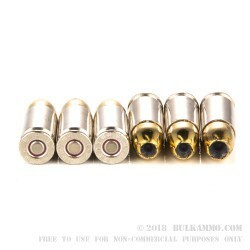 This is a 124 grain brass jacketed hollow point that features the Golden Saber profile and it is loaded in a nickel plated brass cartridge casing that contains a Boxer primer, allowing for easy reloading and an excellent value add. 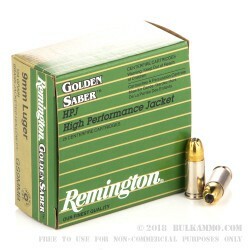 The Remington name is synonymous with quality manufacturing and long-term success in the shooting world and this Golden Saber line of 9mm loads is no exception. This round will be suitable for use in any 9mm factory firearm without concerns for reliability or functionality.